Aug. 23, 2017 - Structurlam is the first Canadian manufacturer of cross-laminated timber (CLT) to be certified to the Sustainable Forestry Initiative's 2015‑2019 Chain-of-Custody Standard. Structurlam blends the expertise of wood science with the ingenuity of European fabrication to produce mass timber products including CLT, the next-generation of engineered wood products. Structurlam has manufactured CLT for six years and supplied the product to over 350 projects in North America. Extensively tested, the product has vast applications for construction. Structurlam produces CLT at its Penticton facility in Southern B.C.’s Okanagan region. The company is part of a global movement to use wood in mid- and high-rise buildings. Advances in technology are producing more engineered-wood and mass timber products that increase the capabilities of building with wood. A showcase project for Structurlam is the University of British Columbia’s Brock Commons. 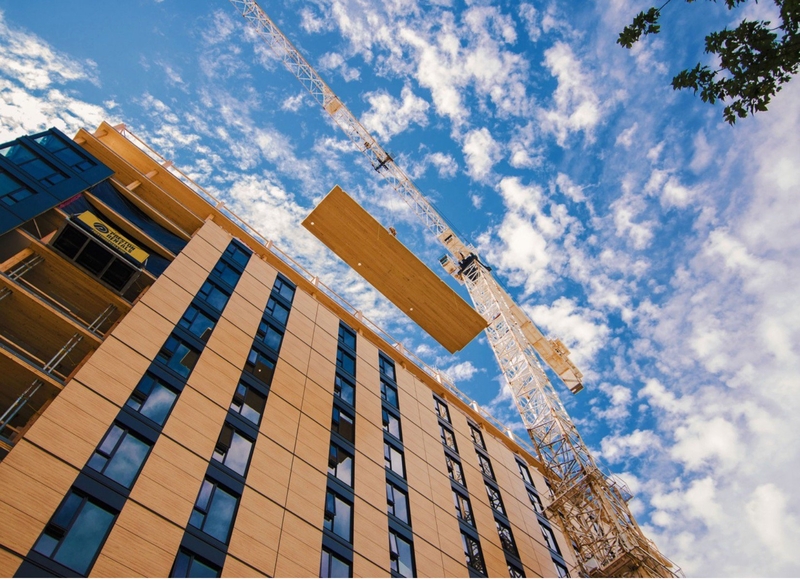 This 18-storey student residence stands 53 metres tall and is the tallest wood structure in the world. The mass timber structure was completed in just 66 days. Over 460 CrossLam CLT panels were used during the building process along with over 1,300 Glulam columns, a structural timber product manufactured by gluing together individual pieces of lumber. Structurlam will also be able to use chain-of-custody certification to position itself as a supplier in the green building market that is officially recognized by green building rating systems. Wood products sold as certified under the SFI Chain-of-Custody Standard allow CrossLam CLT to earn Leadership in Energy and Environmental Design (LEED) credits through the LEED Alternative Compliance Path or credits through the Green Globes Rating System. Structurlam’s products are also ideal for smaller projects. The Zangari Residence in Seattle used 67 prefabricated CrossLam CLT panels, which were delivered and installed in 12 days. It was designed by Susan Jones for her family. She is Principal Architect at the architecture firm atelierjones. “When you walk inside a building that features wood you get a feeling of relaxation – the smell of the wood, wood on floors and ceilings, all very much integrated with nature. We wanted our home to be an example of how to build lightly with wood in a sustainable way in the city and still capture the fundamental connection with nature that people instinctively have,” Jones said. Jones will be a keynote speaker at the 2017 SFI Annual Conference in Ottawa Sept. 27-29. She will talk about the importance of well-managed forests for clean air and water, habitat for wildlife, commercially valuable products like wood, and sequestering and storing carbon. Jones supports sustainability by using cross-laminated timber in her architectural designs.